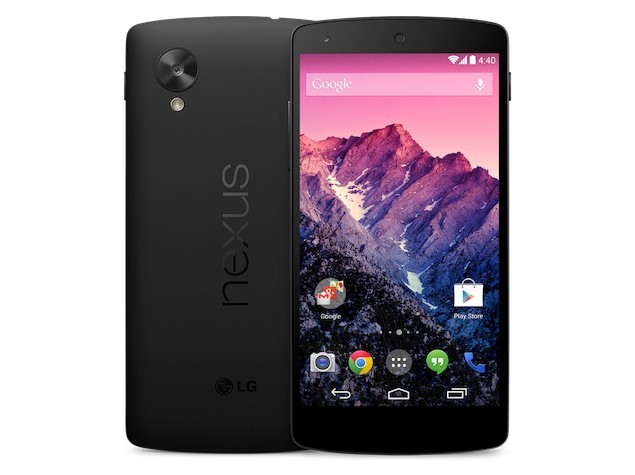 After weeks of speculation, Google and LG have officially announced the Google LG Nexus 5 . The Nexus 5 comes with a 4.95-inch full-HD IPS display and is powered by a 2.26GHz quad-core Qualcomm Snapdragon 800 processor alongside 2GB of RAM. It comes with an 8.0-megapixel rear camera and a 1.3-megapixel front camera. It comes in 16GB and 32GB storage options, with Black and White colours to choose from. Google Nexus 5 is the first to run Android 4.4, which brings a new dialer that automatically suggests people the most likely call while Caller ID by Google matches an incoming phone number to a business even if that number isn't stored in the contact list. Users can send and receive text messages directly from Hangouts, and Hangouts for Android now supports location sharing. "LG is proud to partner with Google again to develop the fastest, most powerful Nexus phone ever," said Dr. Jong-seok Park, president and CEO of LG Electronics Mobile Communications Company. "Nexus 5 offers the ultimate functionality in a modern design and is a testament to the level of innovation that can be generated when two great companies come together for a second act." Nexus 5 is now available for purchase (no contract required) on Google Play in the United States, Canada, France, Germany, Italy, Spain, U.K., Australia, Korea and Japan. "We're excited to collaborate with LG on a new Nexus device," said Sundar Pichai, senior vice president of Android, Chrome and Apps at Google. "Google Nexus 5 is the slimmest and fastest Nexus phone to date and puts the latest platform innovations of Android 4.4, KitKat, right in the hands of consumers. 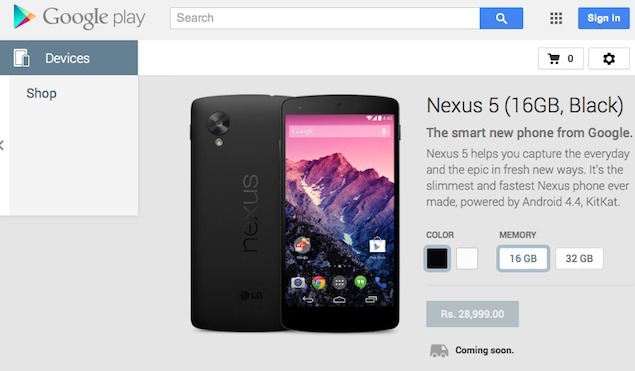 Interestingly, the phone has been listed on Google Play India as well carrying a price tag of Rs. 28,999 for the 16GB variant ($349 in the US) and Rs. 32,999 for the 32GB variant ($399 in the US). However, the listing just says "Coming soon" and does not mention an actual release date. LG says the phone will be available offline in Asia and other market in mid-November, but it's not clear if that includes India.